A beautiful, elegant of contemporary Judaica with a timeless design! Israeli jewelry designers Emunah Jewelry have crafted a simple symmetrical gold pendant in which a classic symmetrical Star of David is encircled by a thin gold circle, the star's points just touching the circle's inner edge. No decoration or embellishment is needed on this gold pendant necklace. 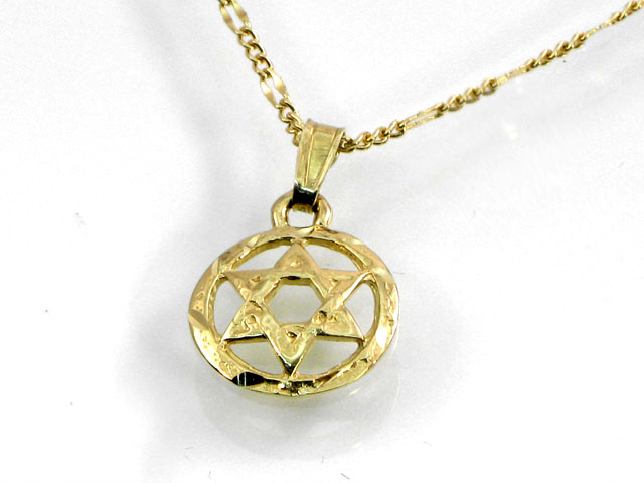 This gold Star of David circle pendant can be worn by men or women of any age. Jewish jewelry in gold makes a wonderful present for the holidays, or to mark occasions like a bar mitzvah or a bat mitzvah. The warm tones of the 14 karat gold used in this necklace will warm the heart of anyone who loves fine Jewish jewelry and appreciates high-quality handcrafted Israeli jewelry.